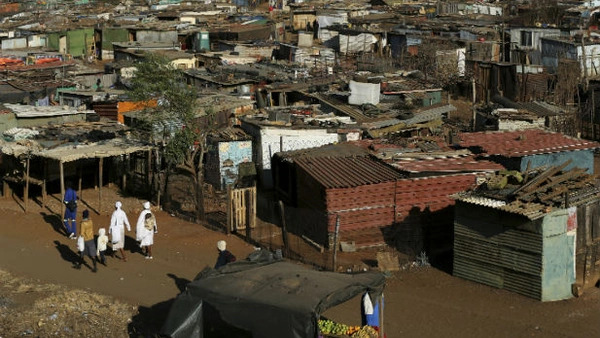 South Africa is notorious for having gross income inequality. Its GINI coefficient–a standard for measuring income inequality–is one of the highest in the world. The World Bank computed it at 63.1 in 2009, with zero being absolute equality and one hundred absolute inequality. According to the U.S. Census Bureau, the GINI coefficient for the United States in 2012 was 47.7. When analyzing these two GINI coefficients, there is a danger of comparing apples with oranges. The GINI coefficients here cited were developed by two different institutions, no doubt with different methodologies. What GINI coefficients actually show is also a matter of debate. Still, they indicate income inequality was greater in South Africa than in the U.S. in recent years. Similarly, it is hard to compare the purchasing power and cost of living in the two countries. Cost of living has a practical impact on inequality. If living costs are very low, inequality may be more supportable. The Economist’s Big Mac Index, widely used as a marker of purchasing power parity (PPP), compares the price of a Big Mac across countries. As of July 2014, a Big Mac in South Africa cost less than half of the price of one in the United States. So, if income inequality is greater, the cost of living in South Africa would appear to be lower than in the United States. On the other hand, the United States is a much richer country than South Africa. American poor are better off in material terms than South African poor. Twenty years after the end of apartheid in South Africa, the 9 percent of the population that is white is richer per capita than the 80 percent that is black. But, with the coming of democracy and affirmative action programs, it is getting better for blacks. The improvements in townships with respect to water supply, housing, and roads is for all to see. Similarly, a common assumption in the United States is that while black poverty persists, more African Americans are moving into the mainstream, so much so that affirmative action programs are being dismantled. Nicholas Kristof goes some way toward demolishing those comfortable assumptions in his New York Times column of August 31, 2014. Referencing the police shooting death of Michael Brown in Ferguson, Missouri, he cites a Harvard and Tufts study in 2011 that shows many whites believe that anti-white racism is a bigger problem than anti-black racism. Kristof asserts that the relative position of blacks and whites in South Africa and in the United States is similar. Citing 2011 census data, he notes the average net worth of a black household in the United States as $6,314, while for a white household it is $110,500. He estimates that whites in the United States own about eighteen times as much as blacks, while in South Africa in 1970, at the height of apartheid, the ratio was fifteen times. He concludes that the gap between white and black incomes in the United States is about 40 percent higher than it was in 1967. Following a similar trajectory in South Africa, The South Africa Survey 2013 shows that the gap between white and black incomes is greater now than it was with the coming of “non-racial democracy” in 1994. How to account for the persistant racial inequality and black poverty in both countries? There are obvious differences: levels of incarceration are much lower in South Africa and South Africa has a much more developed social safety net than most parts of the United States. But, there would seem to be similarities. One is the persistence of racial prejudice. Another, harder to measure, is the stress on family structure. Apartheid labor practices were notorious for destroying family units, and many of them persist, even if the underpinning ideology is gone. Another is the failure of the educational system to prepare blacks to participate in the modern economy, resulting in unemployment rates of some forty percent among black men in South African townships and widespread black youth unemployment in the United States. The persistence of black poverty would appear to be a largely unspoken element in the rioting in Ferguson, Missouri. Poverty as a driver is explicit in Julius Malema’s Economic Freedom Fighters, a South African anti-white party that calls for the expropriation of white-owned farmland without compensation.